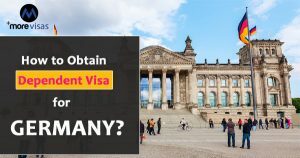 Home » Uncategorized » How to Obtain the Dependent Visa for Germany? Germany is the second most populated country in the world, right next to the United States of America. Statistics show that about 12% of the country’s residents are immigrants with a majority of them coming from Turkey and Poland. There are many ways by which you can come into the country, both legally and illegally. Moving to Germany illegally would attract criminal actions against you if you are caught, and this could lead to deportation. Legally, there are ways by which you can move to Germany and become an immigrant. To immigrate, you will need a valid reason. There is immigration for employment, entrepreneurs, education, family reunions, and residence permits. This article will be discussing ways that you can become an immigrant with a dependent visa. What Do You Need to Move to Germany? • That you understand the basics of the German language. • You also need a Visa. What Kind of Visas are There? To get into Germany, you need to get a Visa. The visa is different for the different purposes for which you are in the country. It could be an education visa, entrepreneur visa, employment Visa and so on. There is also the dependent visa. Many times, people move or immigrate to other countries to find work, and this makes them leave their family behind. If you are in this kind of situation, but you want your family with you, then you should learn about the dependent visa. The dependent visa is a kind of visa that allows you as a dependent of a legal resident (either permanent or temporary) of Germany the right to enter and stay in the country. The dependent visa is often applied by the spouse of this legal resident or by dependent children who are aged under 18. This visa allows for the family to be reunited. For the visa to work, the lawful resident of Germany and the applicants need to put in some effort and patience as the process usually takes time. The lawful resident of Germany needs to be able to show that he or she has a job that can be used to sustain you. This means that he or she has a steady job and would not need to rely on the government to provide you with basic amenities. On your part, you also need to show that you have a relationship with the person in Germany. It means that you need to show genuine documents. For spouses, this means you have to show your marriage certificate, and for children under 18, you need to provide a birth certificate. You would also need to learn how to speak German so that you can mix with the people in the environment quickly. With the dependent visa, the spouse is also allowed to work if the sponsor in Germany is already working. Stay updated with the latest information about Visa and Immigration. Please take MoreVisas free evaluation to know whether you are qualified or not and also it will help you to understand further options available to you.